Firearms transfers into CA (a bit OT)? 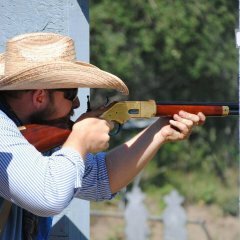 California has very defined laws regarding change of ownership of any firearm post 1899. The brother does not meet the criteria for intra family transfer, which in itself requires a form sent to CADOJ, so must go through the FFL process. For the brother to go and pick it up with the idea of returning to California, he will have illegally imported a firearm into the state. He doesn't want that drama. Shipping a long gun into California is simple enough to relieve him of the headache of other methods that could land him in jail. Phantom has it correct. Hunting rifles such as you describe are not restricted like handguns. 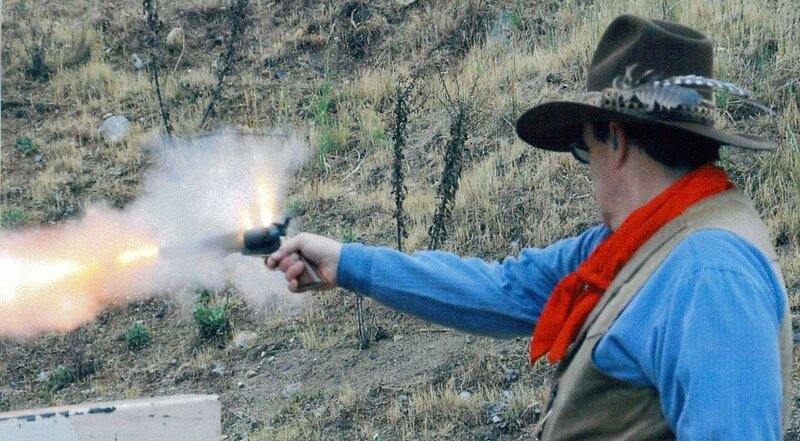 I've shot gunfighter with C&B many times and have had an occasional cap jam. Fire the good one until empty then address the fouled one. Properly set up C&B's are good insurance they will work well most of the time but be prepared to address the occasional problem inherent to the breed. Nothing funner than GF with a Navy '51. For an out of basement move, someone with a stair climber is the hot ticket. Basically it's a dolly with an electric jack to climb the stairs. My safe is 1100#s and was moved by one guy. I was suggesting an angled plate on a knock down. I wasn't clear in my verbiage. Since there is no perfect solution as of yet, would it be possible to experiment with a known target that consistently has backsplash? Personally, I would attach a plate at 10-15° and see how the splatter reacts. If it solves the issue, then you have the fix. Still didn't answer the question so I will take the high road and let it go. My response "Typical" is to your statement "Don't Care". It is typical for you to give this answer when a debate doesn't agree with your position. 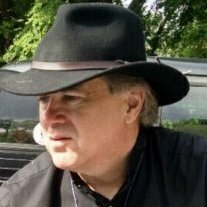 This may surprise you Phantom but I have been around you and have personally seen you in action since the early 2000's when you were at the State Matches at 5 Dogs Creek with China Camp and at Norco annuals. We have had a few spirited debates on the Wire as well. I have a solid basis for my opinion whether you agree or not. You are among the first to jump someone when they cite a rule that either doesn't exist or is misinterpreted but you "Don't Care" when it applies to you. My question was for you to support your statement that basically the cited section applies to staged guns. There is no mention anywhere on the page about staging guns. It speaks to starting position and location. It certainly implies the correct staging of guns and ammunition but is not solely for that definition. Come out west sometime and I'll buy you a round of your favorite libation and we can debate in person. Can you show me where this section is referring to staging guns? It speaks to starting position and location. The TO initially attempted to get her into the intended starting position so any comments by the other range officials prior to the beep is moot. Perhaps the shooter didn't understand the intended starting position of "At the Ready" since it wasn't demonstrated during the reading of the stage instructions. No penalties were applied as she was unable to load the 11th round into her rifle and ultimately started from "At the Ready" on the restart. That suggests to me she knew what the position entails. The discussion between the range official and the TO occurred after the stage had been completed as a hypothetical call had she been able to load 11 and started out of the intended position. Yes, I was there and witnessed the incident in its entirety. My department carried Model 10's for 27 of my 30+ years. 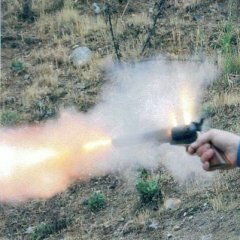 When we switched to 38 +P jacketed ammunition, we had forcing cones crack on a real regular basis. We were burning in the neighborhood of 140,000 rds of ammunition per year through our range weapons just for my facility so were losing 15-24 forcing cones annually. This was happening even with +P proofed barrels. If memory serves me, the forcing cone is factory cut at 6 degrees. If you have the forcing cone cut to 11 degrees, there is less of a problem. We had no problems with them when we carried and used lead hollow points. The most accurate round for target shooting out of a K-Frame Smith is a 158gr hollow based wadcutter with a mild charge of your favorite powder. My favorite is 4.5 grs of Unique. The difference here is, the revolvers were not staged on the table, they came from the holster. I think a P is in order irregardless of the first touching the table.